Today I am sharing another layout I made with the November scrapbook kit. I fell in love with the “Paradise Dream” piece of paper from the AB Studio Dreamland collection. I loved the small and large butterflies on opposite sides of the page and it made me think of creating a design of a large cluster and a small cluster on top of the butterflies. I kept it simple because I didn’t want the butterfly images to “get lost” on the page. I started out by adding some stenciling with pink and then grey distress ink in the areas surrounding the two butterflies. From there, I added a couple of tags to each side. I added some eyelets and thread to the tags. Each cluster got some of the patina gears and Prima Marketing metal clocks peeking from under the tags. Each cluster also got a photo with lace peeking from under it, some of the 49 and Market pink flowers from the kit, as well as some smaller pink and red ones from my stash which are from 49 and Market also. I also added a Creative Embellishments chipboard key to each cluster that I embossed with some black and gold powders. If you are thinking of trying out any of our kits, NOW is the perfect time. We are having a Black Friday Sale RIGHT NOW! Check it out! The month, the papers in the kit are from the beautiful Dreamland collection from AB Studio, an international company in Poland, designed by Aga Baraniak. These papers are amazingly gorgeous, and there are MANY images to fussy cut, which can add so much dimension to your layouts. In addition to many beautiful floral images, there are many options with these papers to create masculine layouts, which really makes them ideal for so many projects. Annie cut out a tag from the papers and used the AB Studio flower stamp to create some wonderful layers. 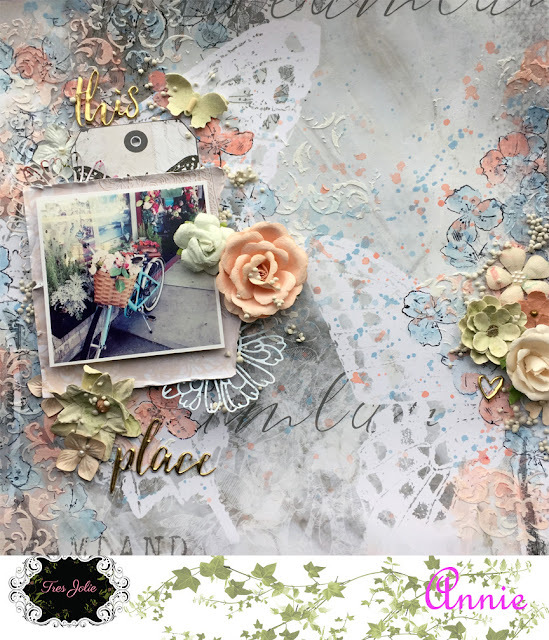 Rae cut out many tags and floral elements to create a back drop for the photo, tucking in the patina gears and Prima clock, added some of the lace trim under the photo, and added the yellow and green 49 and Market flowers. Ginny also used the AB Studio stamp to create a rustic layout, keeping the Creative Embellishments chipboard (feathers and keys) in their “naked” state, adding the lace, Prima clocks and the Kraft color 49 and Market flowers and elements for this design. As you can see, there are so many ways to use this kit that is chock full of amazing products this month, and every month! Be sure to check out the blog frequently for more spotlight videos and inspiration from our design team! For details on subscribing to this kit and the other monthly kits follow the link below.